Nine (9) people were randomly selected out of the 389 people who entered our April 2019 Contest. These nine (9) people won a ten dollar ($10) Amazon.com gift card. A random number generator was used to select winners. Purchase does NOT increase odds of winning. 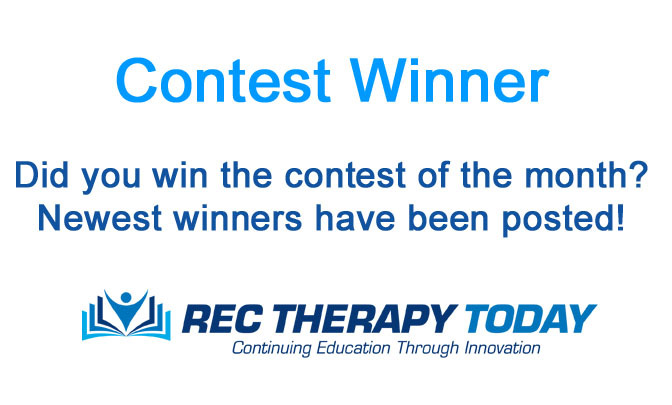 There will be more contests at Rec Therapy Today in the future. We try to provide at least one giveaway every month — and sometimes more. Continue your education. Continue your success. Continue your career. Sign up for self-study CEU courses. Click here.